Plaque commemorates those who served No. 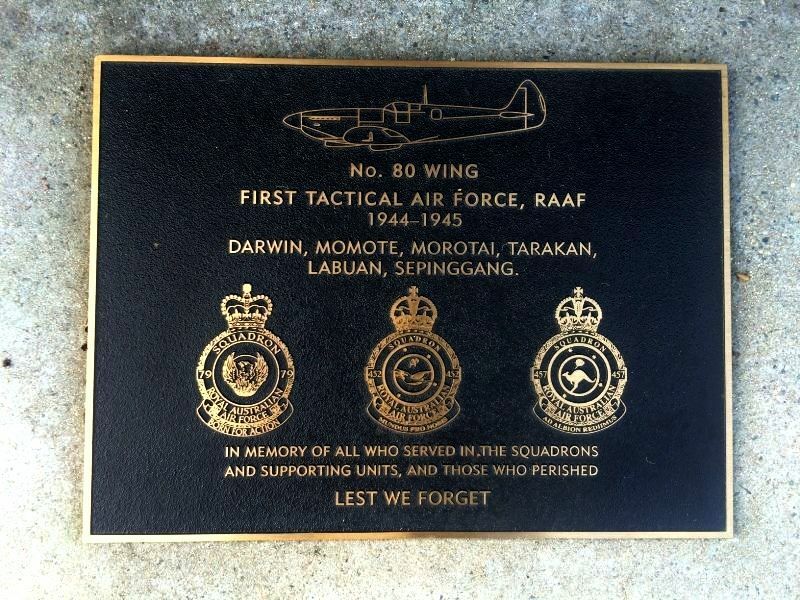 80 Wing First Tactical Air Force Royal Australian Air Force (R.A.A.F.) between 1944 and 1945. No. 10 Group, of which No. 80 Squadron was still part, was redesignated the First Tactical Air Force on 25 October 1944. On 15 January 1945, four of No. 80 Squadron's pilots were ferrying Kittyhawks from Noemfoor to Morotai when they missed their destination and had to land on the Japanese-held Talaud Islands, where they were captured and executed. The unit completed its move to Morotai on 21 January, where it continued to operate over the Maluku Islands. The shortage of worthwhile targets in this area caused morale to decline in No. 80 Squadron and other RAAF units in the area from the end of 1944. No. 80 Squadron was taken off operational status on 11 April 1945 to prepare for the Borneo Campaign.